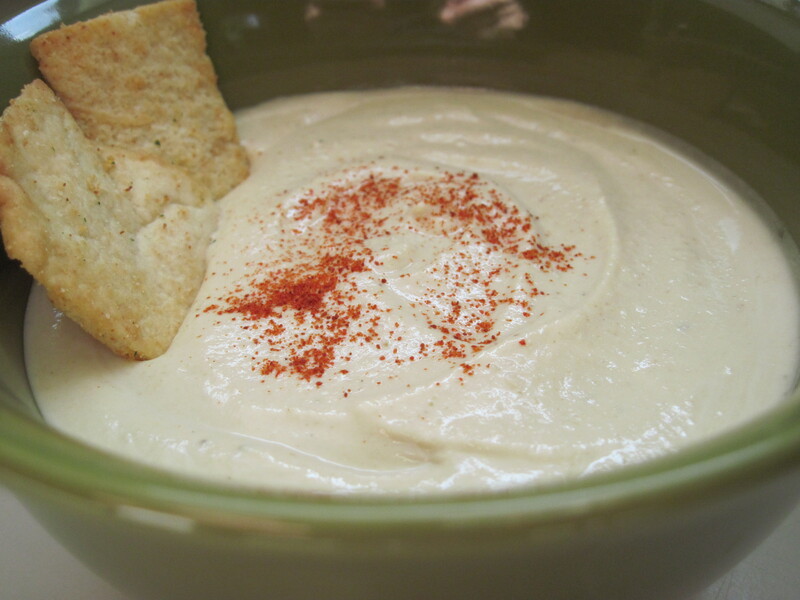 I have always been a big fan of this creamy, smoky dip. As I was walking through the farmer’s market the other day, I saw some beautiful eggplant and was instantly inspired to attempt making some from scratch. It turned out to be surprisingly simple and incredibly tasty. 1. Pre-heat oven to 375º F and generously oil a baking sheet. 2. 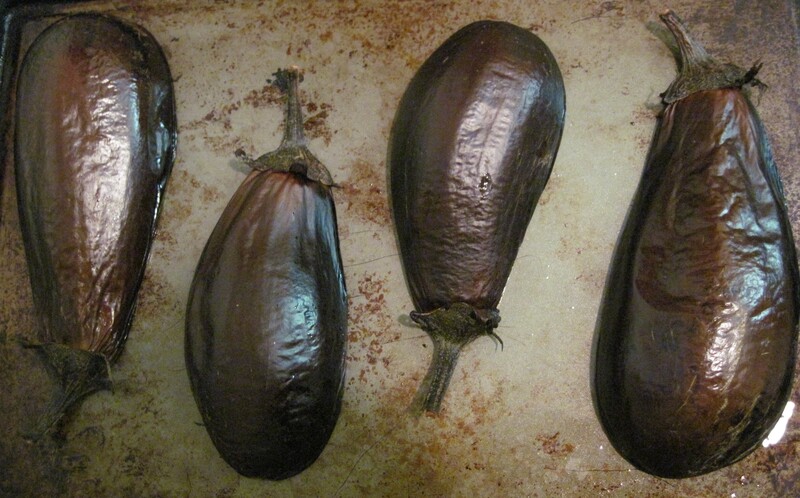 Slice eggplants in half, lengthwise, and place cut side down onto the pan. Bake for about 50 minutes, until the flesh is very soft. 3. Scoop out the flesh into a strainer and place over a bowl. 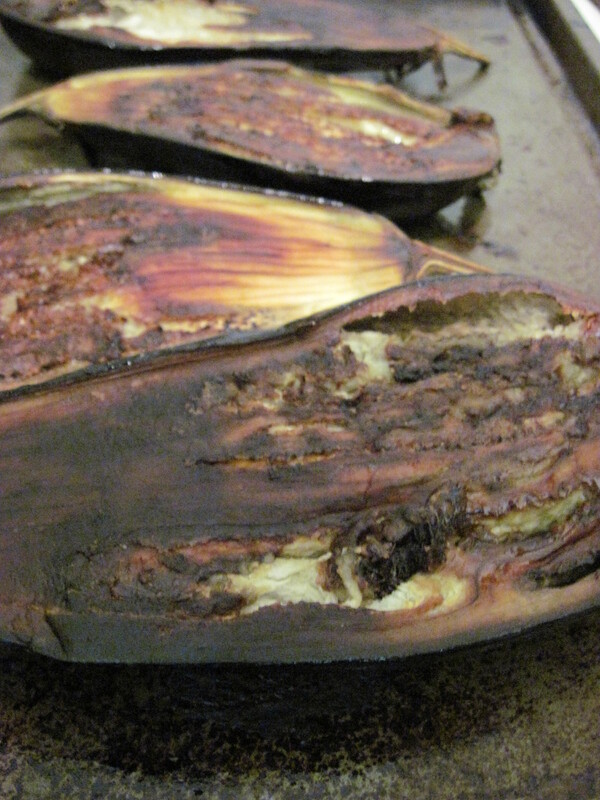 Let the eggplant drain excess liquid for 30 minutes. 4. Place all of the ingredients into a food processor or blender and blend until almost smooth. 5. Chill until use, allow to rest at least 1 hour. 6. Serve at room temperature. Serve at room temperature as a dip with pita bread or pita chips. I decided to finally make and share this recipe for beetnik cake: a chocolate and beet cake with subtle flavor and beautiful color. It goes well with raspberries (the batter even smells like raspberries) and chocolate ganache. 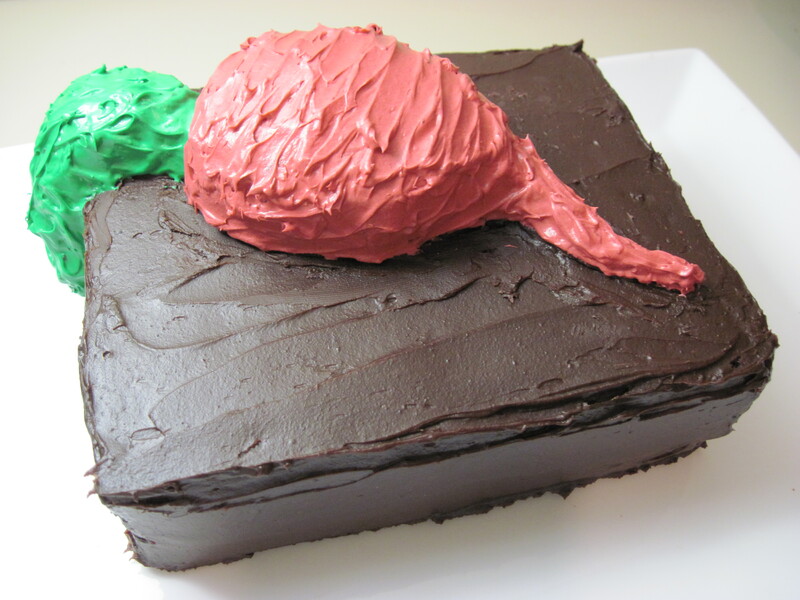 While the name of this blog has nothing to do with the cake with the same name, the two undeniably share a name. Plus, beetnik cakes are made with real beets, so this should be of interest to most veg cooks. Thanks to Vegalicious for providing the inspiration and recipe! 1. Preheat the oven to 425º F.
2. Wash the beets, trim the ends off and cut in half. Place in a large baking dish and add a little water to steam them. 3. Cover in foil and bake for 30-45 minutes, or until the beets are easily pierced with a knife. 4. After letting the beets cool some, slip off the skins under running water. 5. Puree the beets in a medium bowl. 6. Add eggs, oil, sugar and vanilla and mix well. 7. In a large bowl, combine flour, cocoa powder, baking powder, and salt. 8. 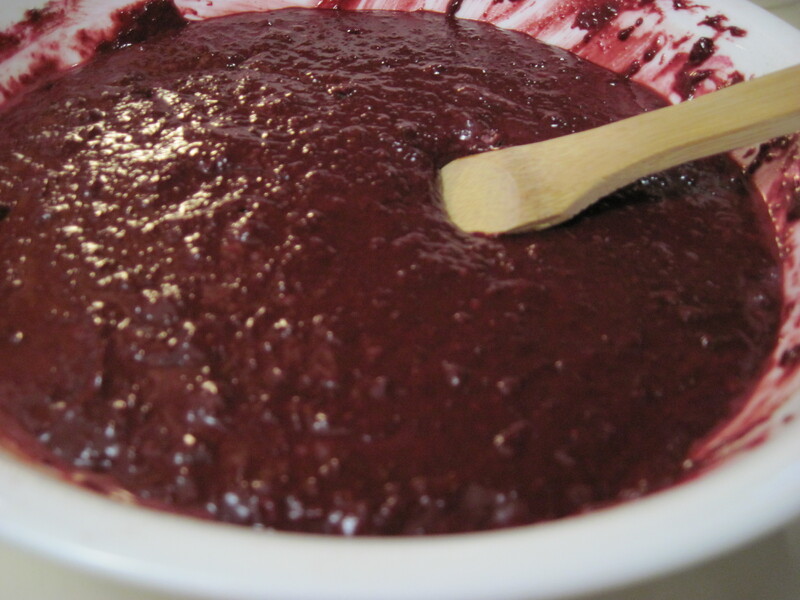 Add the beet mixture to the flour mixture and stir until thoroughly combined – thickness should be similar to a brownie batter. You can add up to 1/4 cup water if too thick. 9. Pour the batter into a prepared (oiled and dusted with flour) 8 x 9 baking dish and place in the preheated oven to bake for 30-40 minutes. The cake is done when the center of the cake springs back. 10. Let the cake cool for 10 minutes before removing and transferring to a cooling rack. Let the cake fully cool before preparing (cutting, forming, frosting, etc.). This cake has been layered with a raspberry filling in the middle and slathered with a bittersweet chocolate ganache. Of course, the decorative aspects are completely up to you! But, whatever you decide, get creative and ambitious! I NEVER bake and I managed to do this, which, in my humble opinion, looks AND tastes pretty great! 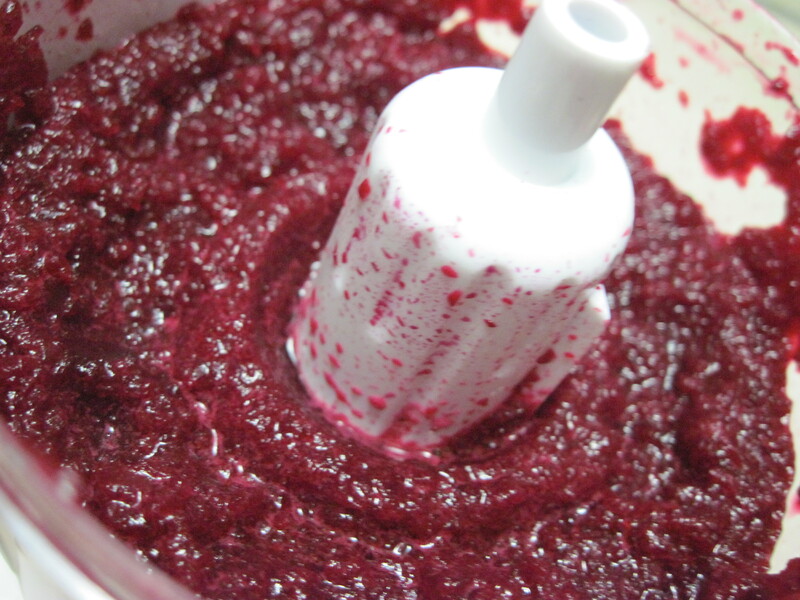 •The beet puree can be made in advance. So if you want to spread out the cake prep, that’s a great project to do ahead of time. •This cake works great if you cut into thin layers and layer with a rich and sweet filling (such as raspberry filling or ganache). It also goes well with walnuts which you could just add to the batter before baking. 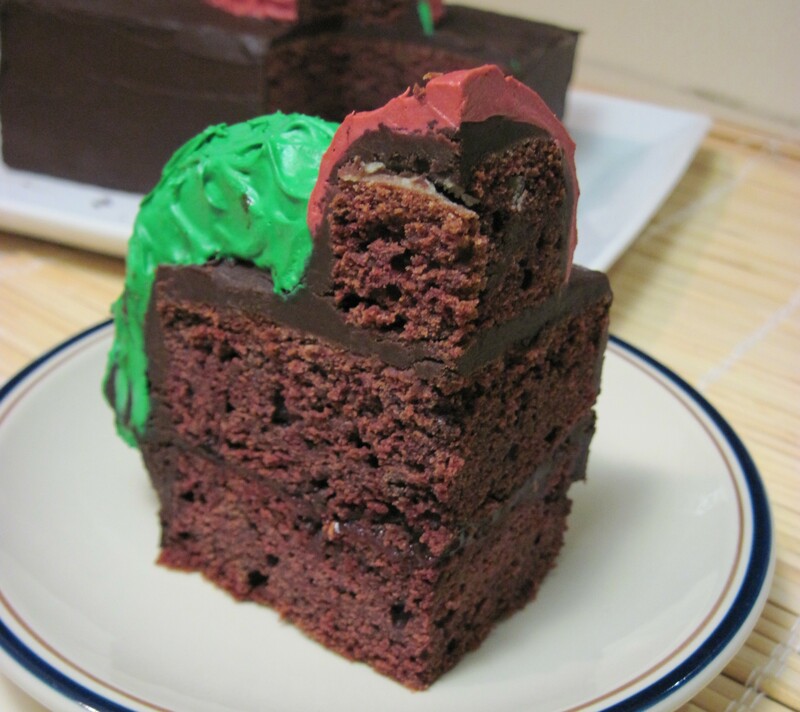 •Use cake scraps to mold 3-D design, using ganache as both glue and primer. Then mix butter cream or another white frosting with food coloring to serve as paint. I sometimes wonder if I am a pregnant woman stuck in a man’s body. I get cravings ALL the time! Right now, I’ve been craving guacamole pretty regularly. This recipe is just how I like it: simple, chunky, mashed avocado with a few other veggies, some light spices and a little heat. It’s super easy and refreshing to eat during these hot summer days! 1. Finely chop the jalapeno (remove seeds if you want a milder guacamole), garlic, red onion and tomatoes. Set aside. 2. Cut avocados in half, de-pit (whack sharp knife into the pit and twist out), scoop out the flesh and mash in a large bowl, leaving fairly chunky. 3. Squeeze the juice of 1 fresh lime over the avocado to prevent browning. 3. Add the chopped vegetables, cilantro, cumin, salt and pepper and mix with a fork until well incorporated. 4. Cover with plastic wrap or move into sealable container and chill for at least 30 minutes. This will allow the spices and heat to bleed into the dip. 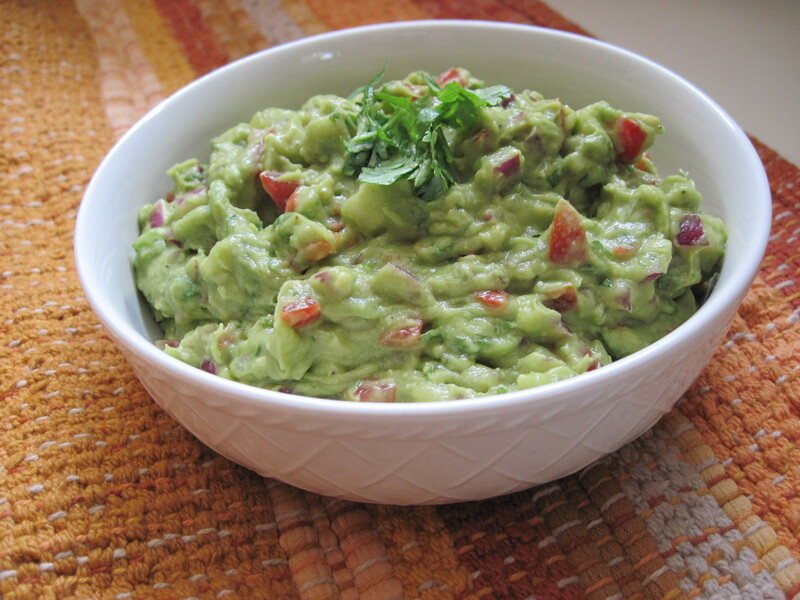 Obviously, guacamole is great with tortilla chips or as a condiment for most any Mexican dish. 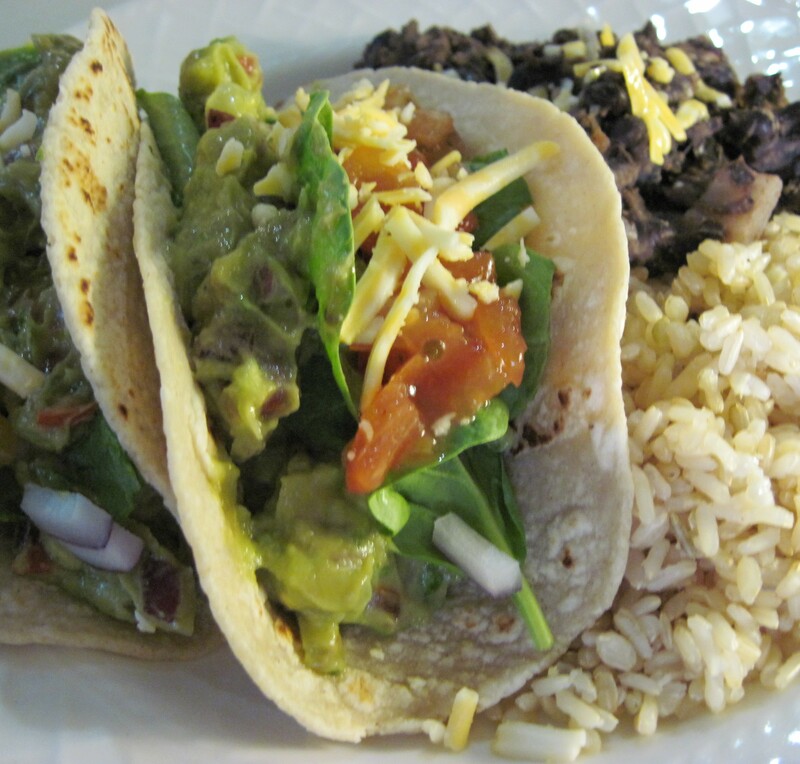 However, when I’m craving guacamole (like I am now), I love making guacamole tacos (see below). It’s a great alternative to typical grilled veggie or fake meat tacos. Serve with some fresh brown rice and homemade refried black beans – easy, filling, balanced and delicious! 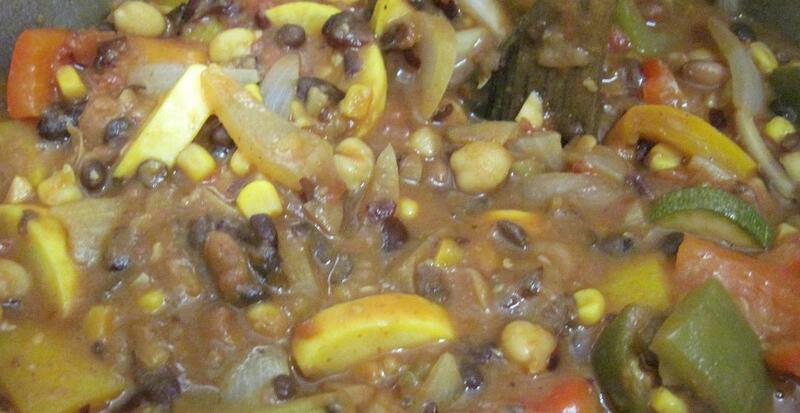 This vegetarian chili is a little non-traditional in that A) it has a nice Middle Eastern/Indian flavor, and B) it is actually quite good for you. 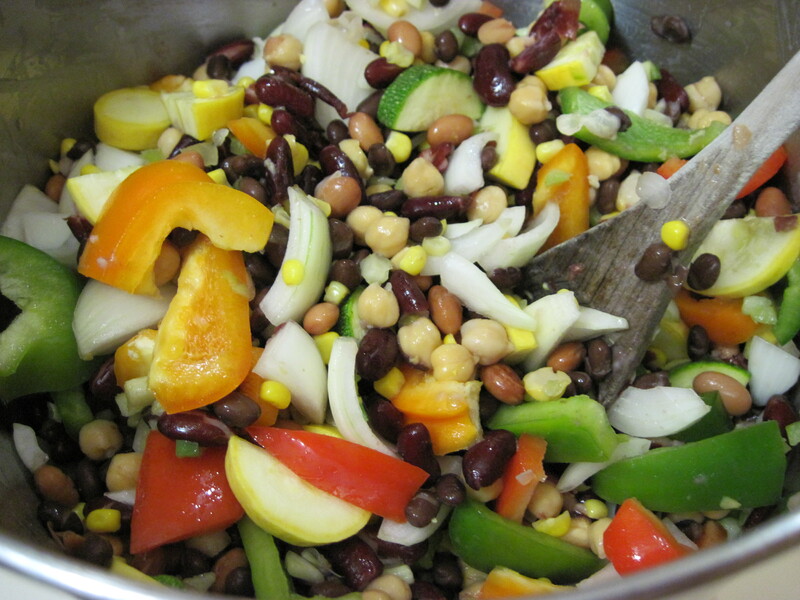 Every spoonful will deliver hearty beans and chunks of veggies, and the only fat in the dish is what comes naturally from the beans (which is fairly minimal). But this isn’t one of those veggie soups that you love because it tastes okay and is really good for you. This stuff tastes really good! 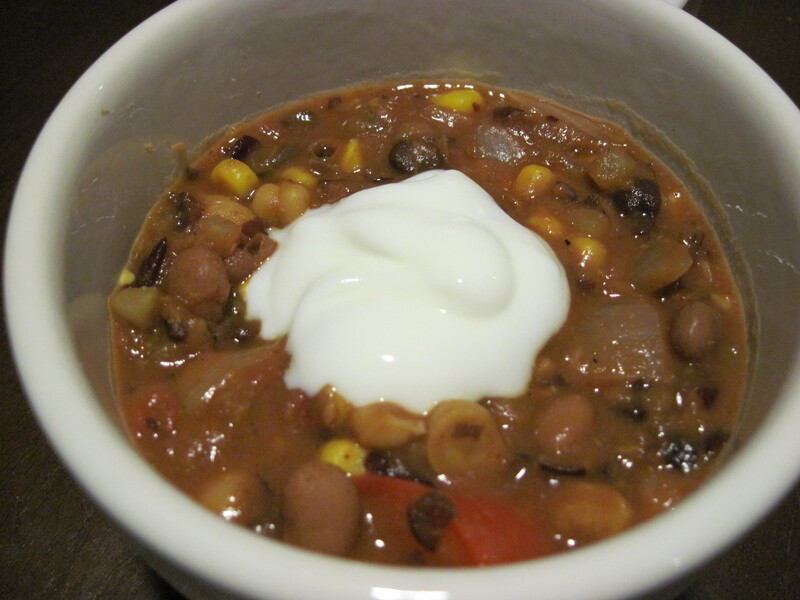 Meat- and non-meat-eaters alike have fallen for this chili, and I hope you will, too! 1. Finely chop the garlic. 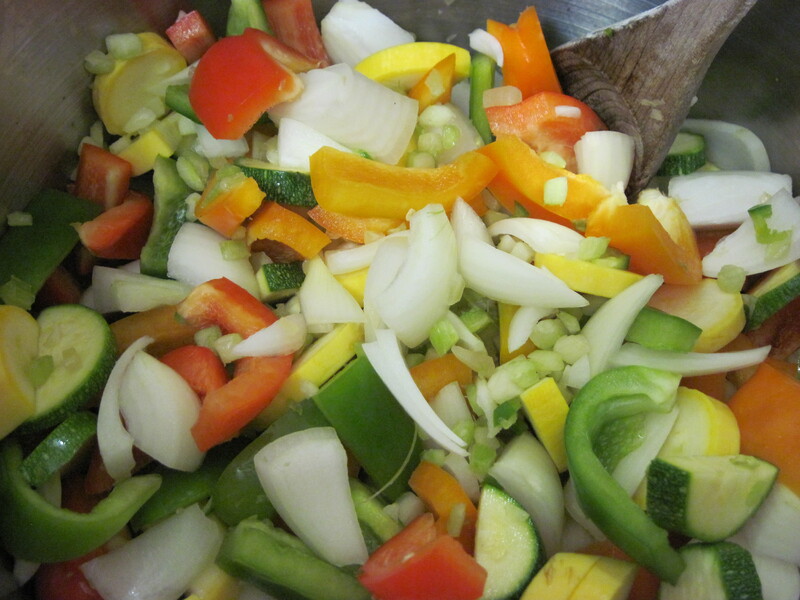 Chop the rest of the vegetables so that they are roughly the same size (you want them to cook at the same speed). I generally chop into larger pieces so you can bite into the vegetables, but smaller pieces will cook faster. 2. Rinse and drain all beans (and corn, if canned). 3. Combine all ingredients in a large (8 quart) saucepan. 4. Once all ingredients are thoroughly combined, cover and heat over medium heat. Stir occasionally. 5. Once the chili begins to simmer, turn the heat down to medium-low and cook until vegetables are tender. Stir regularly to make sure the bottom does not burn. 6. It should take about an hour from the time you turn on the burner to when the vegetables become tender, but timing will depend on your pot, stove and size of vegetable pieces. My preferred way to serve this chili is with a dollop of plain yogurt, and if I want a little extra spice, a dash of cayenne pepper. The cool dairy and little extra spice go well with the cumin and coriander. However, don’t worry! You can still sprinkle with chopped onion, shredded cheddar cheese and/or some sour cream and serve with corn tortilla chips. Or even serve in a bread bowl. The traditional chili accompaniments work quite nicely! •Where’s the liquid? When you first combine the ingredients, you’ll notice there is very little liquid/sauce. Don’t worry, as you cook the vegetables, water will be released and it will get cooked into the sauce. You don’t want to add any additional liquid because it will become too soupy. This should be fairly thick. •The timing for cooking the chili is really more of a suggestion. About an hour is the bare minimum of what you should do. If you want something lighter and crunchier, do less time (just note the flavors may be less cohesive). I tend to let it simmer a little longer (an additional 20 minutes or even more), to make sure the flavors fully develop. 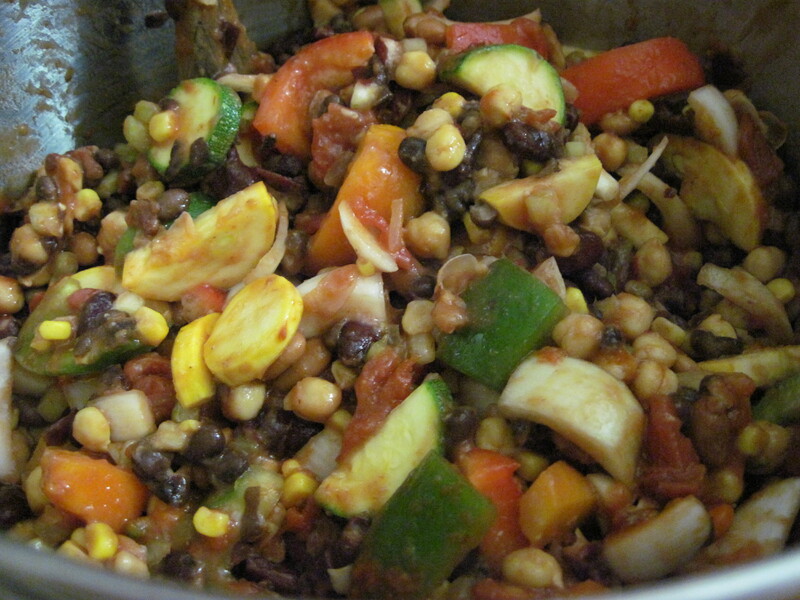 You’ll be surprised how long the veggies will hold up before becoming too soggy or overcooked. •This dish is freezer friendly. It makes 4 to 5 quarts. When I was living alone I would make it and freeze in several single-serving containers and it would last several weeks. Here is an old family recipe for tomato sauce. I sure hope my family doesn’t mind me posting this, but it’s so delicious and straight-forward, I just want to share it with everyone! The key here is to use the best ingredients you can find, and to cook it slowly. It will pay off with large amounts of tasty sauce that you can use for all sorts of dishes! 1. 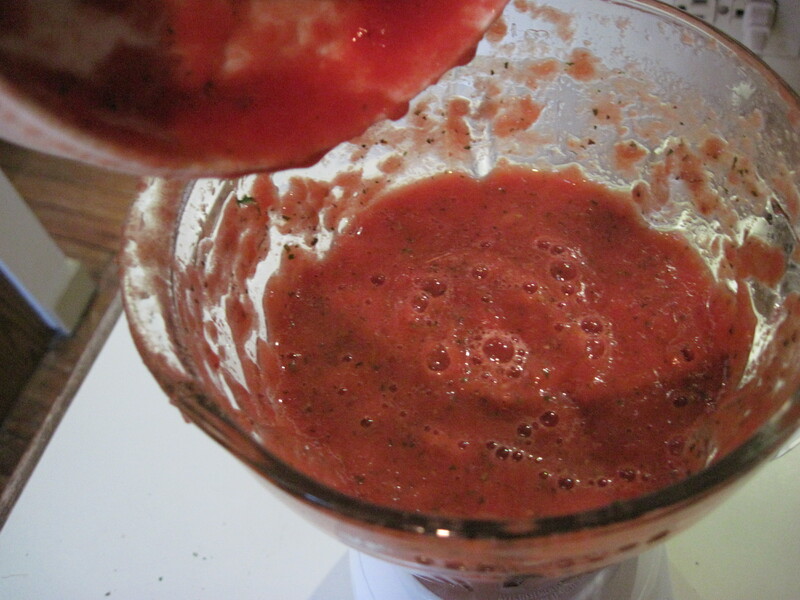 In a large blender or food processor, blend all canned tomato products, parsley, oregano and anise. Don’t over-blend, you will want to keep some body (this shouldn’t be super chunky, but you don’t want a runny, thin sauce either). 2. Heat olive oil in a large sauce pan over medium heat. Add and sauté the garlic until it starts to brown. 3. Add the blended sauce to the pan and bring to a simmer. Simmer on low heat for at least 30 minutes, stirring often. Be sure not to let the sauce boil. This sauce is great by itself on any pasta dish. 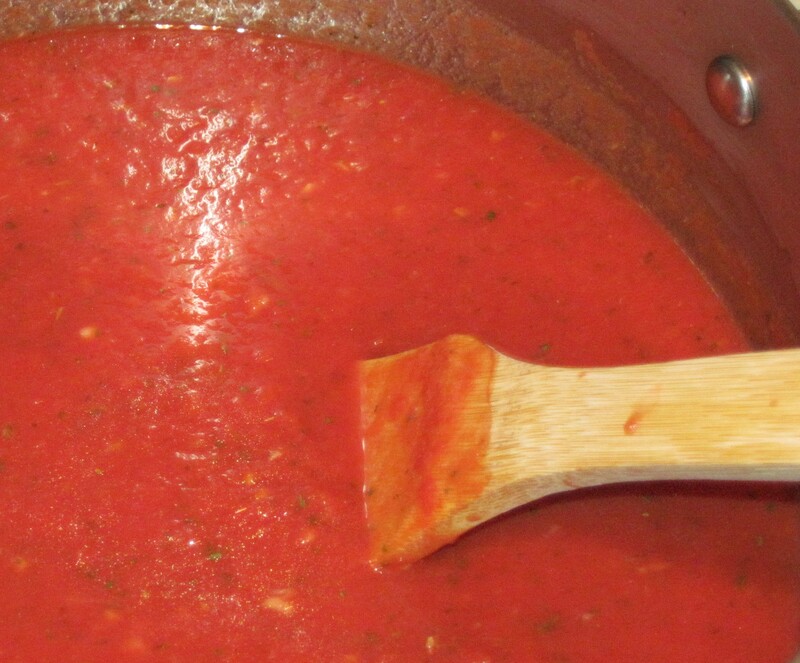 I also particularly like making this sauce for delicious, real homemade lasagna or baked ziti. It brings a nice, fresh, bold flavor to these dishes that you just can’t get with jarred sauces. •The sauce gets better the longer you let it simmer and the longer it sits. If you aren’t sure you can get a good hour of simmer time (or more), you will likely want to make the sauce ahead of time. •This sauce freezes really well. Whenever I make it, I often double the recipe (note – this already makes a hefty portion!) and freeze several large containers worth. •If at all possible, use jarred tomatoes instead of canned. The combination of the acidity in the tomatoes and the chemicals in the can is apparently a very bad one. I have a hard time finding it, so still use canned most of the time, but try to find jarred, jar some yourself, or try to find organic canned tomatoes that were just recently canned. As a vegetarian, you tend to eat a lot of stir-fry. And getting creative with stir fry can be a challenge. In the end, it’s all sautéed vegetables, perhaps with a new combination of vegetables and/or spices. That’s why I’ve been trying to make more homemade dishes that are just as convenient and full of good-for-you veggies, but with a little more pizzazz – dishes that provide a little more sense of adventure and accomplishment. So here’s one that has become a good ol’ standby. It’s super fast, inexpensive and, of course, delicious! 1. Heat vegetable and sesame oils in large saucepan over medium-high heat. 2. 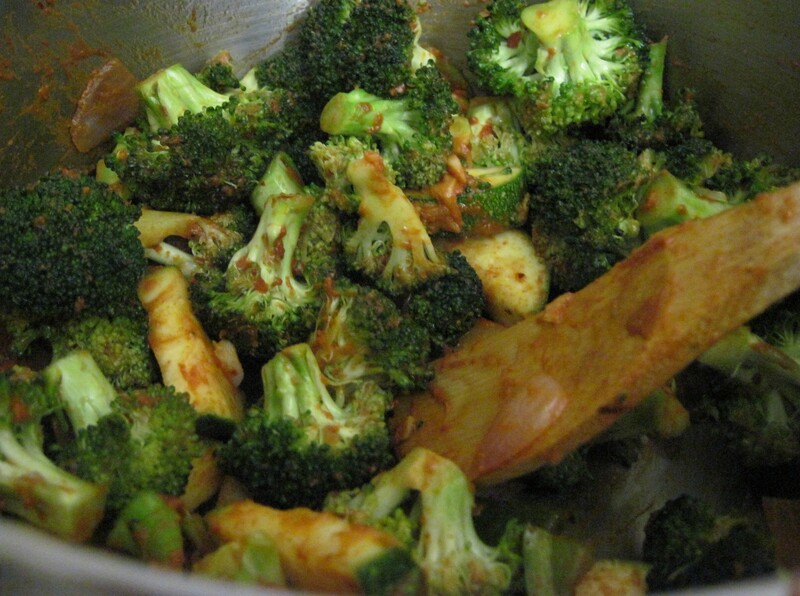 Add garlic, onion, pepper, broccoli, zucchini and green beans and sauté for 4 minutes. 3. Add red curry paste, ginger and red pepper flakes and mix well. Sauté an additional minute. 4. Add coconut milk and stir until thoroughly combined. 5. Add salt to taste and bring to a simmer. 6. Add tofu and gently simmer for 10 minutes until all vegetables are tender throughout and the tofu is thoroughly heated. This dish is best served over rice with a garnish of fresh basil. •This meal is so easy and quick. You can substitute vegetables with whatever you have in your crisper or whatever you find at the store. You can also omit the tofu for a lighter dish, or replace tofu with other items (potatoes, seitan, etc.). •Play around with the spices some. When I’m sick, I like to make this dish with more ginger, garlic and red pepper flakes. When I have people with “milder” taste buds I back off on the red pepper flakes, sometimes even just replacing with a pinch of black pepper. 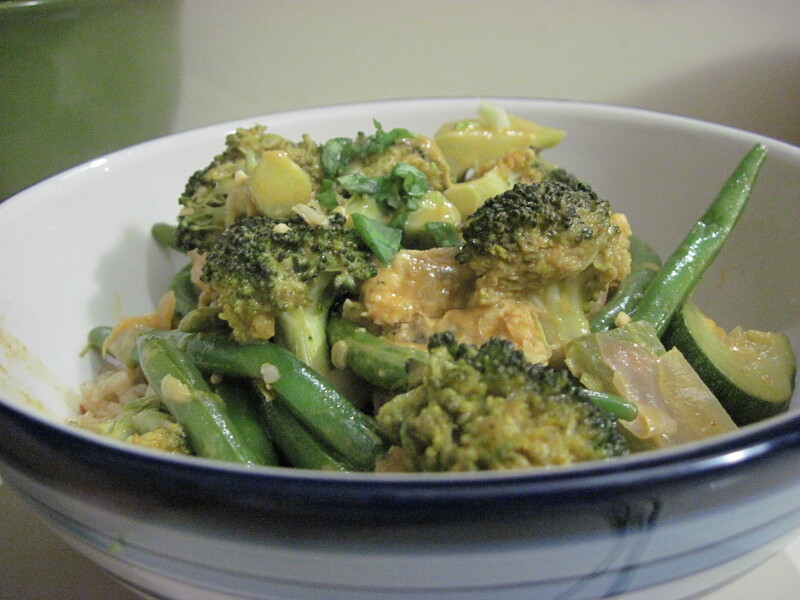 •For a slightly lighter dish, use light coconut milk. It makes the dish a little less heavy and less sweet, but still very flavorful. The thing about hummus is that there are almost as many ways to make hummus as there are to spell it. But this is the version I will most humbly call “the perfect hummus recipe.” It’s a little backwards in the order of steps (compared to most recipes I’ve come across). 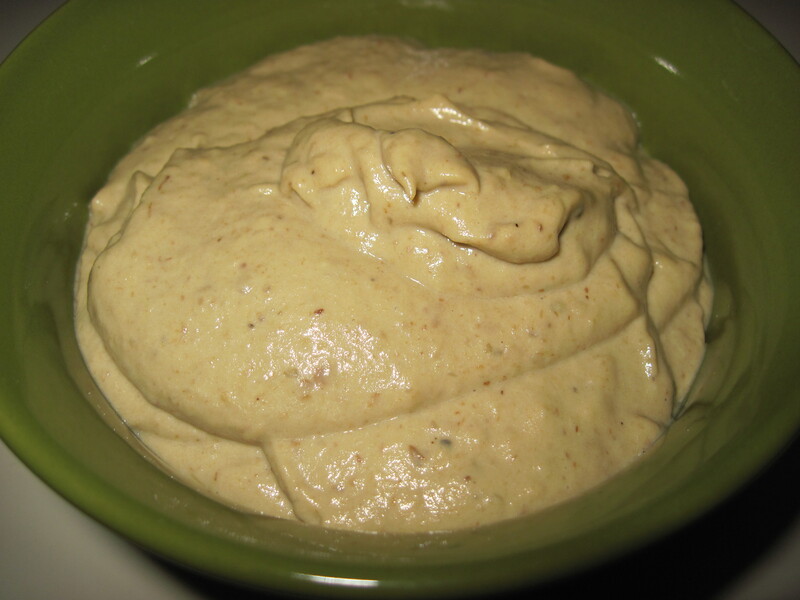 But it works well in a large blender (for those of you who don’t have a super large food processor) and comes out just as creamy and thick as any other hummus I’ve had. I’ve also played around with proportions of the various ingredients A LOT, and this is my favorite combination. 1. Combine garlic, tahini and lemon juice in blender. Blend until thoroughly combined and relatively smooth. 2. Drain the chickpeas, reserving the liquid. Add the chickpeas and a tablespoon of liquid to the blender. Blend until smooth. Use a spatula to ensure chunks from the top make it to the bottom. If it is too thick, gradually add more of the liquid until it is smooth. 3. With the blender running (it should be okay to remove the lid at this point), gradually add the olive oil. 4. Add the cumin and salt and pepper to taste. Blend until well incorporated. 5. Put hummus in an airtight container, or cover in a bowl with plastic wrap, and chill until ready to serve (at least 1 hour or up to 1 day). Enjoy this dish with fresh raw vegetables, pan-fried zucchini, or baked pita chips. Use as a base for a Mediterranean wrap. Add flavor and depth to your favorite sandwich. •I recommend starting with this recipe and then tweaking on later batches. One thing it took me a while to learn is to DOCUMENT what you try each time. I made a few repeat mistakes and forgot amazing combinations because I didn’t keep close track of exactly how much I was adding of what. •Use this recipe as a template. Like roasted red pepper hummus? Something spicier? Roasted garlic? Add your favorite flavor-enhancers and color-adders to this recipe. Just keep in mind that if it’s something more liquid, you will likely want to scale back on chickpea water. Or if it’s a thickening agent, you may want to add more. •Have some old pita bread sitting around? Pull the pita apart into 2 thin halves and cut into small triangles. Bake in a single layer at about 200ºF for about 20-30 minutes. This is a great way to get rid of your almost-stale pita bread and a cheaper, healthier alternative to store-bought pita chips. You can also lightly brush the pita with olive oil and season with your favorite spices for something a little more impressive. I personally like a little garlic, sea salt, ground pepper and poppy seeds.